A Port St. Lucie woman was among four people killed in a crash on Christmas Day in Highlands County. LAKE PLACID, Fla. — UPDATE: The third of the four victims killed in the crah in Highlands County on Christmas Day has been identified as 46-year-old Maggie Lara of Okeechobee. Lara was a passenger in the Buick that crashed head on with a Toyota Xa, killing its driver, 56-year-old Judy Mounts of Port St. Lucie, and a passenger in her vehicle, 16-year-old Destiny Franz of North Fort Myers. The identity of the driver of the Buik has not yet been released. 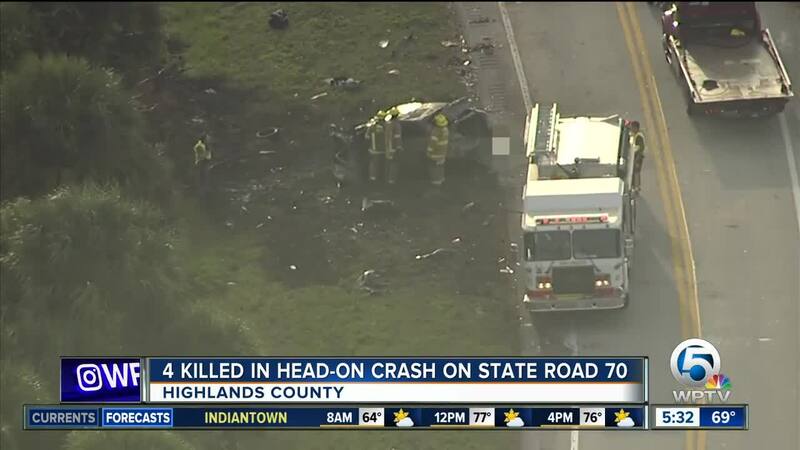 Four people are dead following a two-vehicle crash in Highlands County on Christmas Day. The Florida Highway Patrol said the wreck happened at 12:19 p.m. Tuesday on State Road 70. According to the FHP, a Buick driven by an unidentified person was traveling westbound in the eastbound lane, overtaking other westbound traffic on State Road 70, west of County Road 721, and approaching a curve. A 2006 Toyota Xa traveling eastbound on State Road 70 east of County Road 721 was approaching the same curve and the vehicles crashed head on. The Buick overturned into a ditch and became engulfed in flames. The driver of the Toyota, 56-year-old Judy Mounts of Port St. Lucie, and a passenger in her vehicle, 16-year-old Destiny Franz of North Fort Myers, were killed in the wreck. The names of the driver of the Buick and an occupant in that vehicle were also killed, but their identities have not been released. State Road 70 reopened around 6:30 p.m.
Officials ask anyone who has any information regarding the occupants of the Buick involved in this crash to contact the Florida Highway Patrol at 239-938-1800.